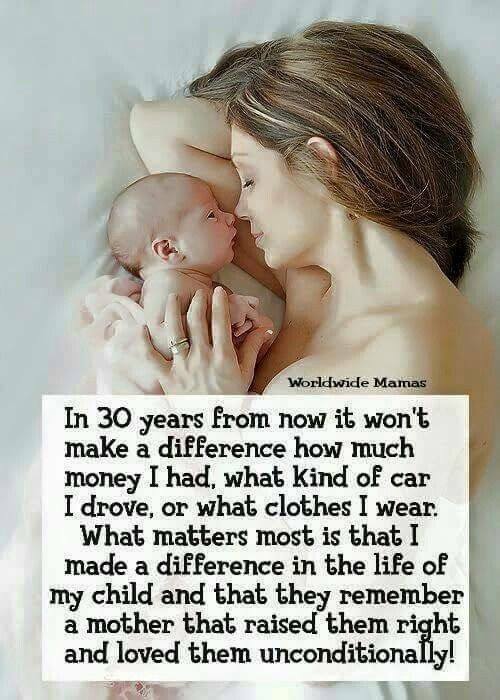 IN 30 YEARS FROM NOW IT WONT MAKE A DIFFERENCE HOW MUCH MON - ProudMummy.com the Web's Community for Mums. IN 30 YEARS FROM NOW IT WON'T MAKE A DIFFERENCE HOW MUCH MONEY I HAD, WHAT KIND OF CAR I DROVE, OR WHAT CLOTHES I WEAR. WHAT MATTERS IS THAT I MADE A DIFFERENCE IN THE LIFE OF Y CHILD AND THAT THEY REMEMBER A MOTHER THAT RAISED THEM RIGHT AND LOVED THEM UNCONDITIONALLY.